If you’ve decided to ditch cable or satellite service, you don’t have to pick up an internet streaming service to replace it. In fact, there’s a subscription-free option: An HD antenna. While you may think antennas are a bygone technology, a quality HD antenna can pick up over-the-air programming from popular networks like ABC, CBS, NBC, Fox, the CW, and a host of others for free, without the hassles of cable. These new antennas are more advanced than the bunny ears of old — though those could technically still pick up the same signal if you’ve got one laying around — and will even be ready for 4K broadcasts when they finally arrive. We’ve combed through the sea of available models and found the best of the best — including one outdoor antenna just in case — to help you get crystal-clear HD programming. Once you’ve made your choice, there’s also our antenna installation guide to make setup a breeze. If you want to be able to save those broadcasts for later, don’t forget to peruse our favorite over-the-air DVRs as well. Editor’s note: Not everyone lives in a neighborhood ripe for antenna viewing, so we recommend taking a look at TV Fool’s TV Signal Analysis tool or a similar site to find out which channels are available in your area before you buy. Why you should buy this: You’re looking for a future-proofed, eco-friendly product. Who it’s for: The eco-minded cord cutter. This eco-friendly antenna is unlike most other antennas on this list, made from recycled, “post-consumer” cardboard and chlorine-free colors, as is the packaging it comes in. It’s also devoid of any paper instructions, which are instead printed on the packaging to eliminate excess waste. The cables and minimal plastic components are made with Mohu’s “MohuGrind” plastic, composed of crushed and ground up recycled cable boxes (take that, cable companies). Just to go the extra mile, all of these components are crafted using renewable energy. It’s great to be earth conscious, of course, but the Mohu Releaf is also just a great antenna. It’s also one of the few examples to advertise 4K support, though this is really just marketing-speak, as any antenna on our list will support the ATSC 3.0 standard that will one day usher in 4K broadcasts. Why you should buy this: It’s a discreet yet powerful antenna with a novel design. Who it’s for: Those who don’t mind paying a little extra for performance. The ClearStream Eclipse offers top-rated performance when it comes to flat, multi-directional HD antennas. This is true of all four available Eclipse models, which come in estimated signal ranges, from 35 miles up to 70. The antenna is two-sided — a black side and a white side — to match your decor. The material is not only adhesive on both sides (meaning no tape), but it also can be painted over, so it can easily become a discreet addition to any room. Even better, the multidirectional nature of the ClearStream Eclipse means it can be mounted virtually anywhere and doesn’t require precise aiming to catch a signal. Unlike many indoor antennas, most of which use a square or rectangular design, the circular design of the ClearStream Eclipse is better at picking up UHF signals, which can be a struggle for many indoor antennas. Those specs make it a great choice for those ready to ditch cable, regardless of where you live. Why you should buy this: The Mohu Curve hides in plain sight while offering excellent reception. Who it’s for: Those as concerned about decor as performance. If inconspicuous and discreet locations are hard to come by in your residence, you might as well opt for a good-looking antenna. Enter Mohu’s Curve lineup, with antennas that look as good as they perform. This free-standing antenna can sit on tables, entertainment centers, or shelves without drawing much attention. The curved design is simple and attractive, and the fact that the antenna doesn’t require mounting means it can be moved to wherever the signal comes in best. An included 10-foot coaxial cable aids in placement flexibility. Throw in an OTA DVR, and you’re likely to question why you ever paid for cable in the first place. Why you should buy this: The Leaf Metro is the smallest antenna of the bunch, but it’s no less capable of providing quality HDTV signals. Who it’s for: City apartment dwellers who need something compact. Though admittedly weaker than Mohu’s larger Leaf antenna, the Leaf Metro antenna is the perfect fit for compact living spaces. Mohu designed the Leaf Metro for discreet installation in homes located close to broadcast towers. As such, those living in downtown or urban areas are most likely to get the best results from the Leaf Metro, which has a range of approximately 25 miles. To compound the versatility enabled by its tiny size, the Leaf Metro antenna also comes in either black or white, so users have the ability to paint it to match their interior. Plus, its adhesive coating means it’ll stick to almost any surface and can be moved to other locations with ease. An included 10-foot coaxial cable allows for fairly flexible installation. Why you should buy this: It delivers long-distance reception, even in less than ideal environments. Who it’s for: Those who live a long distance from signal sources. Despite the Clearstream 2Max’s somewhat complicated design, the antenna is actually quite simple to assemble, using either clamps or a base for installation. Though the antenna is larger than most every other antenna listed here, it’s not so big that it can’t fit behind a TV or mount to the wall of your living room. For outdoor installation, a 20-inch mast is included. While we’re recommending the 2Max model with 60-mile reception, if you live way out in the boonies, it may also be worthwhile to look into the larger and pricier 4Max version of the antenna, which features a 70-mile reception range and (some say) more reliable connection. Similarly, if you live closer to a signal, the 1max, which has a 40-mile range, is also a good option. With such a range of options available in the Clearstream Max line, it shouldn’t be too difficult to find a great way to get free HD TV in the countryside. Why you should buy this: Your home falls outside the reception range of the most powerful indoor antenna on our list. Who it’s for: Those for whom an inside antenna simply won’t cut it. 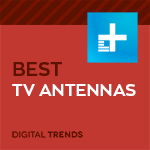 For most users, an indoor HDTV antenna will nab the channels you desire. There are some spots, however, where only an outdoor antenna will do the job. With a reception range of over 70 miles (sometimes more depending on your location), Wingard’s Elite 7550 provides incredible performance and impressive signal quality. That comes thanks in part to Winegard’s proprietary TwinAmp technology, which amplifies VHF and UHF (the two different types of OTA signals) separately and with less noise than other amplified antenna models. It’s smaller and lighter than many outdoor models, making it easy to find the proper location for mounting, and also supports multiple connected TVs at once — you’ll just need to supply the splitter yourself. With an outdoor antenna like this, you’ll have one less device to worry about in your home theater.